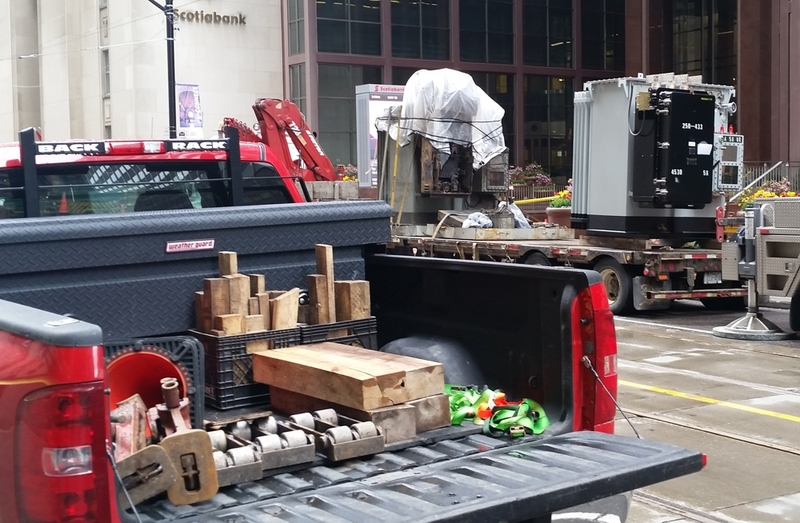 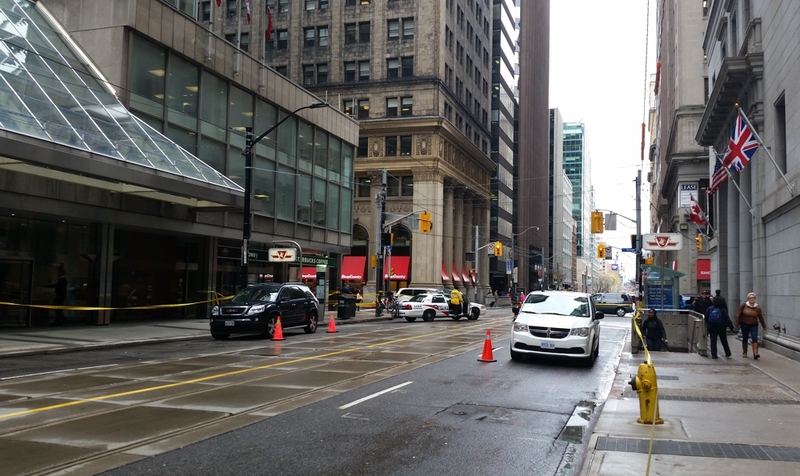 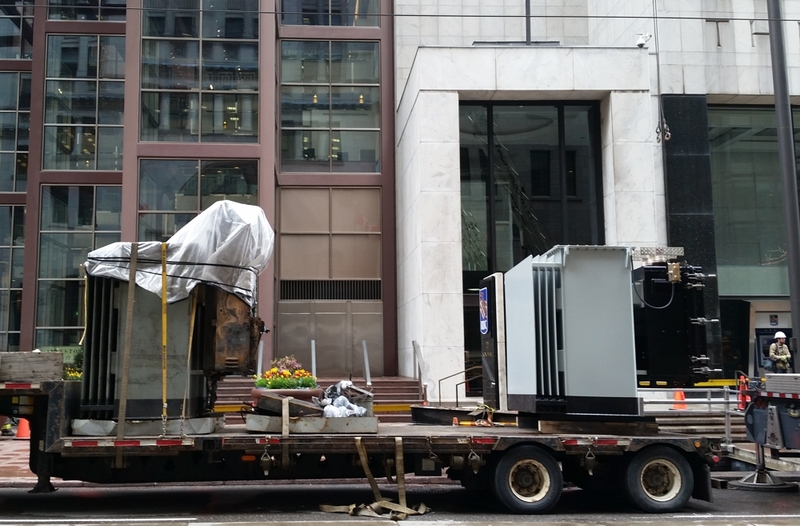 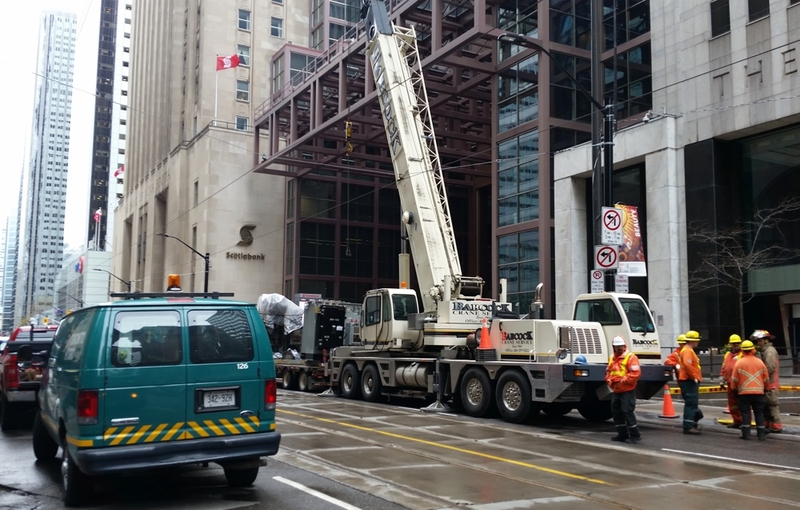 An explosion and smoke from an underground hydro transformer vault at the RBC building on May 1, 2017 caused quite the mayhem in the City's financial district during the afternoon rush hour. Monday's excitement started as pedestrians were passing by the grates covering the vault and the smoke went into the PATH system. Police quickly closed the road as the fire department used carbon dioxide gas to put out the fire which smoldered for hours. 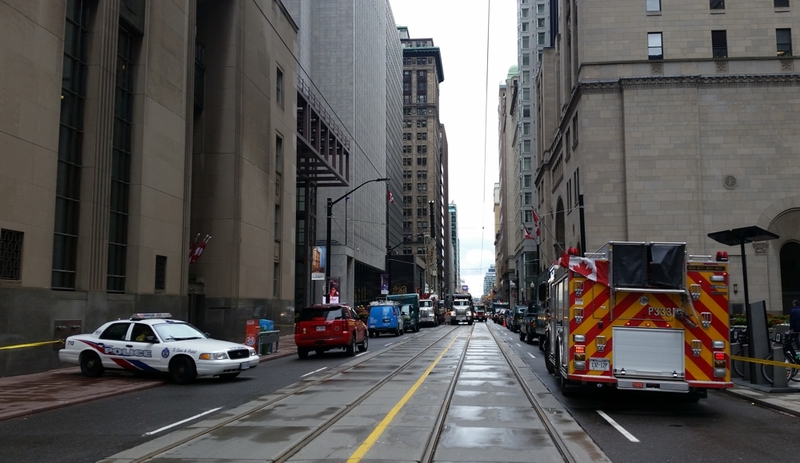 In the photo at top you can see a firefighter cross the street in front of a flatbed trailer that has the damaged transformer (covered in plastic) and the replacement transformer (light grey near the truck). 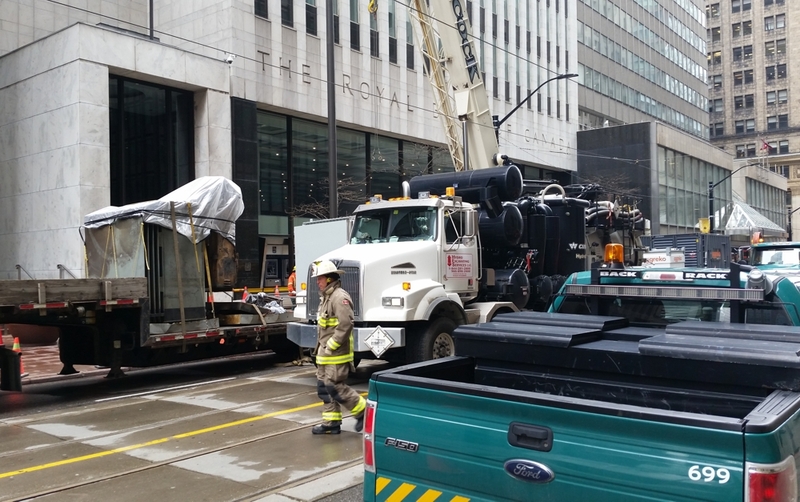 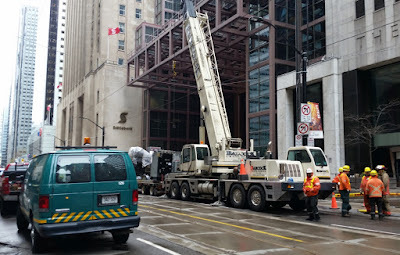 A crane is in the background and is used to lift the units while the truck in front is a vacuum excavator which would be used to pump any water out of the underground vault and possibly clear out some blocked ductbanks. 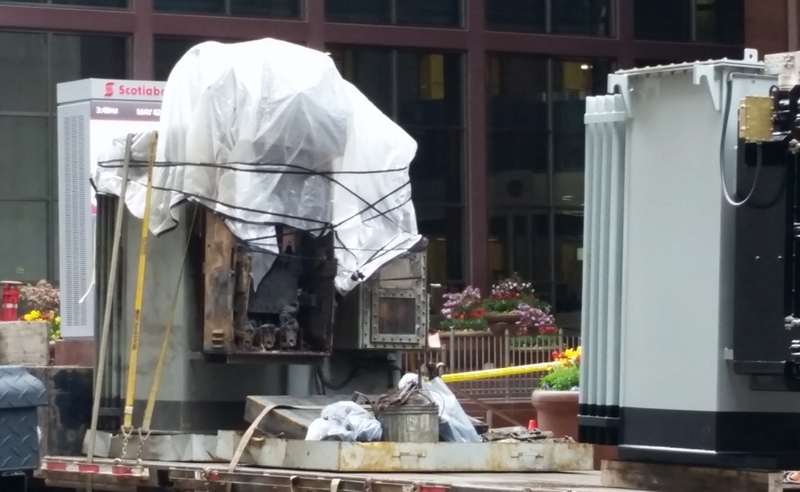 The transformer is oil filled and consists of coils of wire wrapped around metal cores. It looks like the cable or connection might have failed and arcing of the high voltage would have caused the explosions. 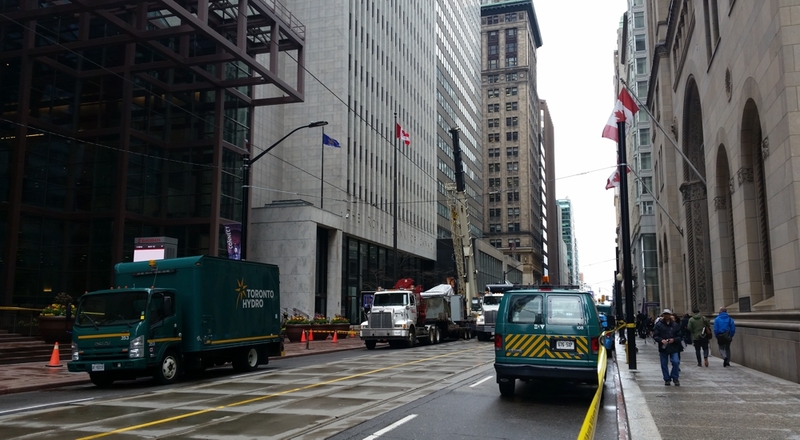 Fire and the arc would melt the plastic insulation of the cables and caused the heavy smoke. 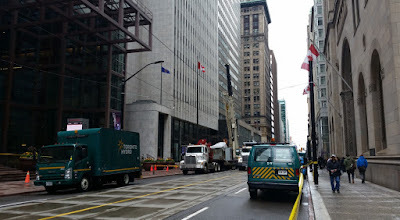 If power wasn't cut off immediately due to the fault current then the explosions would continue until power was switched away from the area or the cables degrade enough where they couldn't sustain the current flow. They would probably have to splice or replace some of the cables, put the new transformer into the vault, make the connections and perform switching operations to put the transformer and vault into service. I wouldn't be surprised if the work was done by late tonite or early Wednesday morning. 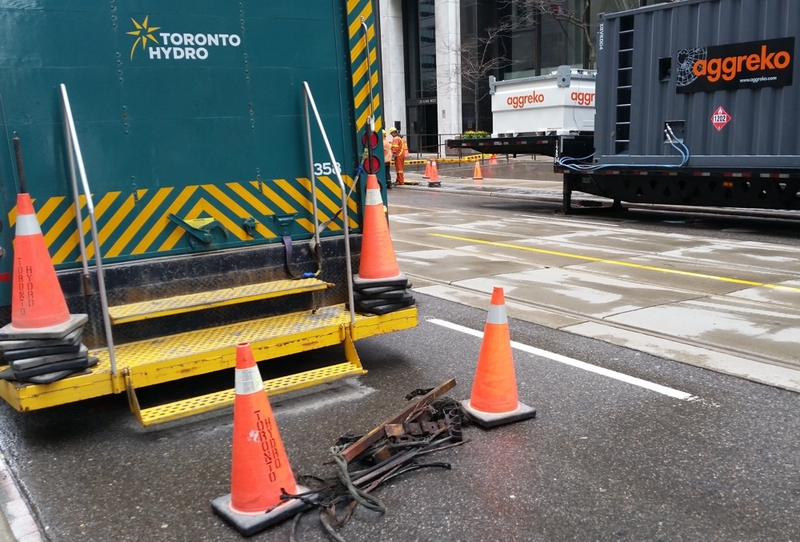 We shall see if Toronto Hydro make public the reason for the equipment failure.